The first Development Centre (DC) was held from July 15 – 19, 2012 at Sanksriti Kendra. There were 17 new Change Loom teams from 12 states represented by 32 youth leaders that participated in this DC. The average age this year (26) was higher than previous years as the upper age range was increased to 35 years. The selection criteria this year has also changed to include teams that have a clear youth focus or at least work closely with young people. The DC this year focused on: a) Perspectives on youth development, b) Instructional Design and Facilitation, and c) Team building. 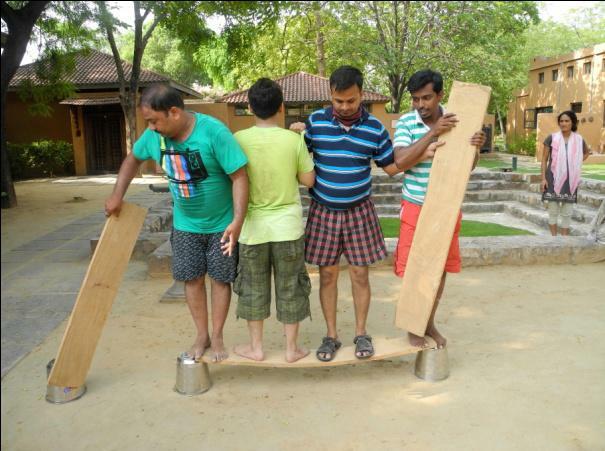 The instructional strategies included outbound sessions on team building, experiential learning and open space sessions during which participants designed and facilitated their own sessions and gave each other feedback. Parallel sessions were held in both Hindi and English to insure that all participants received personal attention and could engage fully. Participants also elected a core group comprising of 8 members, who will now take ownership for identifying the collective learning needs of the participants and organizing learning events in the future.